Roaming Stamper: Inspired by a Technique Challenge! Inspired by a Technique Challenge! 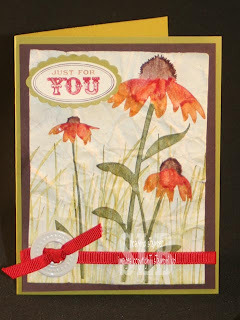 Today's technique challenge at Stampin' Addicts is Faux Suede. I've never done this technique before and I'm not sure I did it right, but I tried. All products from Stampin' Up! For this technique you will stamp your image and then crumple up the paper. You will have to really work at it but then you will separate the layers of paper. After you separate the paper, you apply Versamark over the layer which leaves a little sheen to the raised areas. The ovals look like they were just made for this card! Love the color scheme. Very eye catching! TGIF and a Color Challenge!